Hello and Happy Monday!! Hope you all had a great weekend!!! We are excited to announce that Santa Fe is getting a new Farmer’s Market! It is held on Tuesday, Thursday and Saturday afternoons. Marcy Street is a great street in downtown Santa Fe, walking distance from our office. 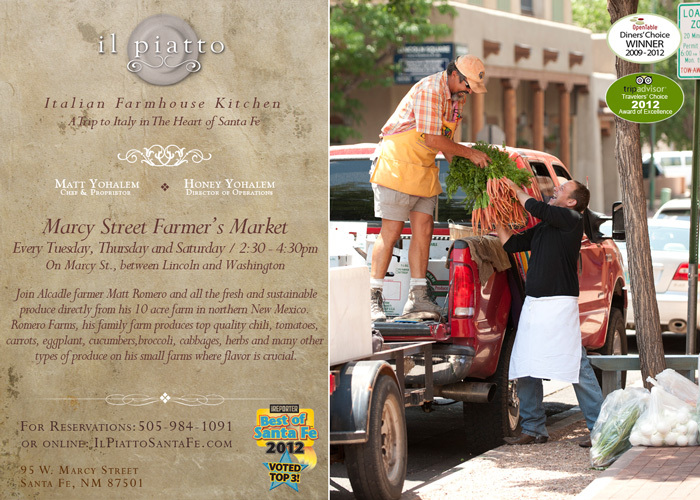 Il Piatto is a fantastic restaurant and we have met Farmer Matt several times at the Santa Fe Farmer’s Market at the Rail Yard. This entry was posted in Uncategorized and tagged Adobe Destinations, culture, dining, Farmer's Market, food, il piatto, local farmers, santa fe day, saturday afternoons, travel, vacation, vacation homes, vacation rentals. Bookmark the permalink.